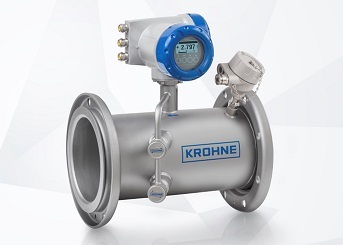 Krohne Inc. now offers the Optisonic 7300 biogas ultrasonic flowmeter, which has been specially designed to measure dry and wet biogas with variable composition. The flowmeter provides additional functions like calculation of standard volume, methane content measurement, and diagnostics features. It features no moving parts and no pressure loss. The flowmeter features a maintenance-free full bore flow sensor without any moving parts. Because the hydrogen sulfide (H2S) in biogas is corrosive when dissolved in water, the measuring tube is made of stainless steel 1.4404/316L and the transducers are made of NACE-approved grade 29 Titanium for maximum corrosion resistance. Optisonic 7300 biogas is equipped with lap joint flanges to lower its overall weight. The measurement accuracy is specified at one percent of actual measured flow rate, when calibrated with air, starting from 3.28 feet per second flow velocity. When two percent accuracy is sufficient, users can select a dry calibration alternative at a significantly lower price. It features a built-in temperature sensor that facilitates direct measurement of methane content using calculation of the molar mass, in combination with the measured velocity of sound. This enables end users to determine the exact methane content of the biogas, necessary when the biogas is used as fuel for gas engines in a combined heat and power (CHP) unit. It can also provide calculation of gas flow volume to standard conditions by using an additional pressure sensor. The electronics also include diagnostics to validate the flowmeter functions and the process. For output of the measured values, 4…20mA and pulse outputs are available. HART and Modbus (optional) are included for field communication. It is certified for use in explosive areas (zone 1). Since no pressure drop is generally allowed in biogas pipelines, the device is available in common line sizes of 2, 3, 4, 6, and 8 in.